Hello and welcome to another edition of Exploring Your Control Panel. So far we've made our way through three of the six tabs of your Control Panel. Halfway there! Be sure to check out our Exploring Your Control Panel archive if you missed any of our previous articles. Today we'll be reviewing your Gig Calendar. It's a pretty straight forward page that displays your booked gigs on a month by month calendar. It's also where you can control which gigs appear on your Profile. Note that this member has two gigs scheduled for February 2012, the month currently being displayed. Click on the date of a scheduled gig and you can view and/or edit the gig's details. A simple drop-down allows you to change the month displayed. 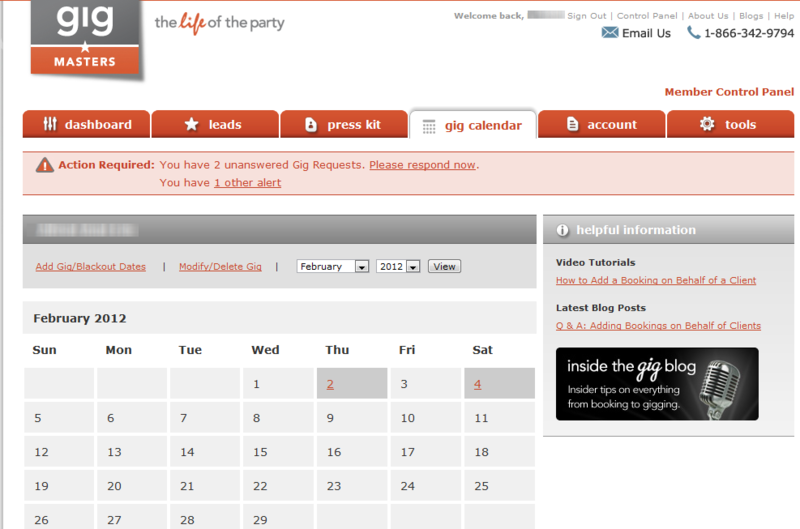 To the left of the date drop-down are two important links: Add Gig/Blackout Dates and Modify/Delete Gig. This second link, Modify/Delete Gig, let's you view and/or edit a particular gig (the same as clicking on the gig's date). The other link, Add Gig/Blackout Dates, is also pretty self-explanatory. If you wish to mark a certain date as completely off limits to clients and gig requests, simply black it out. Pretty simple, right? Calendar Entry: This is for gigs that you'd like to appear on your Profile but don't require any involvement with GigMasters. It's always a good idea to keep the calendar on your Profile up to date because it shows potential clients that you are a busy, in-demand performer. Plus a little extra promotion for your non-GigMasters gigs is always a good thing, right? GigMasters Booking: This feature allows you to report bookings to GigMasters and receive credits towards your ranking and, should your client leave feedback, your rating. Maybe you received a lead through GigMasters and for one reason or the other, the request was closed before you had a chance to book it. Or maybe you have a client that found you outside of GigMasters but would benefit from some of our features (payment guarantees, customer support, contracts, etc. )...this function makes it all possible. Read more about adding bookings on behalf of clients. That's about it for the Gig Calendar. If you ever have any questions you can feel free to contact us or just leave a comment below and we'll get back to you asap.